Obituary for Robert E. Gassett, Sr.
FRAMINGHAM: Robert E. Gassett, Sr., 88, a longtime resident of Framingham, died peacefully Sat. Nov. 10, 2018 at Royal Wayland after a long illness. 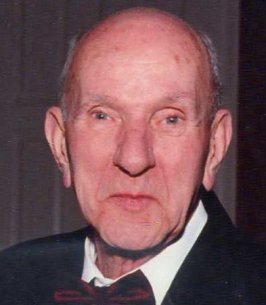 He was the beloved husband of Alice Louise ( McPherson) Gassett with whom he shared 68 years of marriage. Born and raised in Natick, he was the son of the late Herbert H. and Ella (Joselyn) Gassett. An Army veteran serving during the Korean War, Mr. Gassett worked for 50 years for the Town of Framingham for the Sanitation Division, retiring as a route supervisor. He enjoyed fishing of all types: fresh water and salt, casinos and candlepin bowling. In addition to his wife, he is survived by a daughter: Janet L. Gassett Moody and boyfriend Robert Bartlett of Millville and a son: Robert E. Gassett, Jr. and wife Susan of Natick; 2 grandchildren: Jennifer Moody Silveira and Scott Moody and 4 great grandchildren: Triston, Benjamin, Alexis and Adien. He was the father of the late Anne Marie Gassett. Visiting hours are Thursday Nov. 15 from 5:00 to 8:00 p.m. at Boyle Bros. Funeral Home, 173 Union Ave., Framingham. A funeral Mass will be celebrated Friday Nov. 16 at 10:00 a.m. at St. Stephen's Church, 221 Concord St., (Rte. 126) Framingham. Burial will follow at St. Stephen's Cemetery, Fenwick St., Framingham. In lieu of flowers, the family suggests memorial donations in his name be made to: the Alzheimer's Association, 309 Waverley Oaks Rd., Waltham, MA. 02452. For memorial page, please visit www.boylebrothers.com. Additional Information	In lieu of flowers, the family suggests memorial donations in his name be made to: the Alzheimer's Association, 309 Waverley Oaks Rd., Waltham, MA. 02452. We encourage you to share any memorable photos or stories about Robert E.. All tributes placed on and purchased through this memorial website will remain on in perpetuity for future generations.